To-do list apps have stiff competition, from the supremely sophisticated OmniFocus to the simple yet elegant Clear. But none seems to be as wildly popular as Wunderkinder's Wunderlist (available for Mac and iOS), which even has Ira Glass singing its praises as his tool of choice. Once you sign up for a free account, Wunderlist has a full-featured web version, plus native apps for just about every platform on the planet (I'm looking at you, Windows 7). The free version will likely meet the needs of most users, limiting you to 25 assignees, 25 subtasks, 5MB attachments to your tasks, and 20 backgrounds. Upgrading to Pro for $5 per month or $50 per year gets you unlimited assignees, subtasks, and attachment size, and up to 30 backgrounds. A Business account lets you add extra seats and gives you more robust tools for managing your group. Wunderlist makes staying on top of work easy with apps for almost every device you might work on. At its most basic, Wunderlist is a list manager, for anything from must-see movies to grocery lists. How you create, update, and manage your lists varies insignificantly from app to app, but the beauty is just how immediately any changes you make are pushed to all your other devices. No matter whether you're changing Wunderlist's background on your iOS device or adding a note to an item on your Mac, synchronization is satisfyingly snappy. Opening the Mac app reveals a two-column interface with a sidebar on your left containing a list of tasks and a to-do list on the right displaying items associated with any task you select. Wunderlist includes several default task lists, all of which can be configured using the app's preferences, including an Inbox, Assigned to Me, Today, Week, All, and Completed. Task lists act as a way to broadly organize your tasks into major and minor headings. Each task list contains to-do items, and each to-do item can contain a series of associated subtasks. So, for example, if you create a task list called Weekly Homework it could contain tasks for Trigonometry, Spanish, World History, Physics, and Chorus and each of those to-do items can have subtasks for specific assignments. Working and communicating with teams on specific projects is made simple using Wunderlist's Detail View. The only requirement for creating a new list is that it needs a name, but each list has other options, including adding users, assigning responsibility for a task to a specific user, and silencing notifications from the list for anything other than tasks assigned to you. Once you create a list you can publish it to the Web, invite other users to view it, set due dates, turn on reminders, create subtasks, add users, and external files. Anyone you add to a list must have a Wunderlist account and accept your invitation to work with a list or be available for assigned tasks. You view and change this information using a to-do item's detail view, one of Wunderlist's most powerful features. The detail view not only lets you set due dates and reminders, but it's also where you collaborate and communicate with others, add images and other documents, and create notes. You communicate within a task by using a small chat field, and anyone associated with the task is notified and can respond to the conversation. Unless you've turned these notifications off—which you can only do if you aren't the person responsible for the task—you receive updates anytime anyone updates a to-do item you're associated with. This simple communication feature makes it easy for groups of users to stay on top of every Wunderlist task. While I love the detail view, it's also one of my biggest gripes about the Mac app. It's great that each item can include so much detail, but merely selecting an item doesn't reveal that information. You need to double-click to reveal the details in a third column. Even worse, clicking in an empty space outside a to-do item rehides that detail view. A feature like this makes perfect sense on smaller devices where screen space is at a premium, but on a Mac and even an iPad, there should be a preference option that automatically opens the detail view any time you select an item. 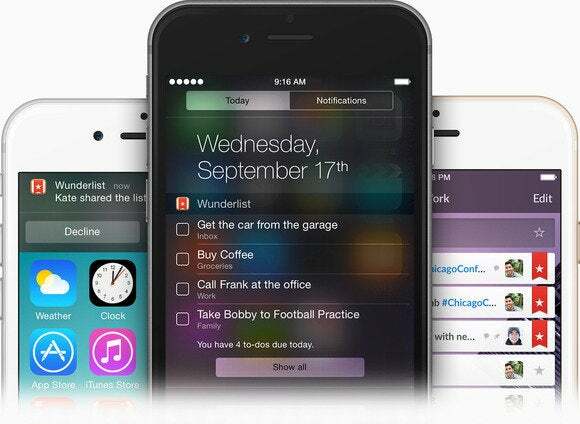 iOS Notifications give you instant updates on Wunderlist tasks you're working on. Thanks to a recent update, Wunderlist's universal iOS app has Dropbox integration, a feature currently unavailable with any of the desktop applications. The iPad app bears a striking resemblance to Wunderlist for Mac, with a small status bar at the top providing up-to-the-second information on all your tasks. Unlike the Mac app, a single tap on any to-do item slides the item's details into view, and you just swipe it away to the right to remove it. I found the iPhone version of to be the most elegant of the lot. The app opens to your list view, and you tap to drill down: tapping an item in your task list takes you to do the to-do list, and tapping a to-do reveals the detail view for that task. Once again, the devil (and the power!) is in the details view. It's here that you can add notes and files, and communicate with others. Wunderlist makes it easy for you to publish your list to the Web for public viewing. The Web version of Wunderlist behaves just like the desktop version, with one notable exception: You'll need to use the Control key rather than the Command key if you like to use keyboard shortcuts. Otherwise, it is an exact replica of the Mac version, right down to the double-click required to reveal a to-do item's detail view. Detail-view clunkiness aside, Wunderlist is one of the best, simplest tools for team collaboration I've ever used. While it lacks the location-aware, context-specific sophistication of OmniFocus, its simplicity lends itself to easy adoption by everyone on your team. The option to assign tasks to specific people and monitor all parts of your team's projects makes Wunderlist arguably the best group task management app there is. Detail-view clunkiness aside, Wunderlist is one of the best, simplest tools for team collaboration.